A brilliant but severely disturbed scientist tries to save his kids from an inherited disease that took the life of his wife. To do this he wants to harness the DNA of the Turritopsis jelly fish in the hope of curing them and creating immortality in humans. This comes at a huge cost that will stretch the fibres of his sanity and push him way past the boundaries of moral sense. This is director/writer Maurice Haeems first feature film and it is incredibly well shot and produced as well as hard hitting, emotional and not afraid to cover controversial topics. 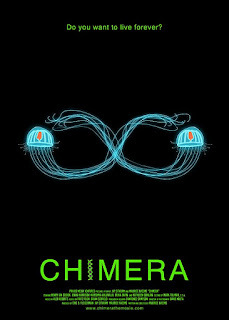 The chimera referred to in this instance is a medical term for certain blood types that carry stem cells required for merging DNA (I think!) 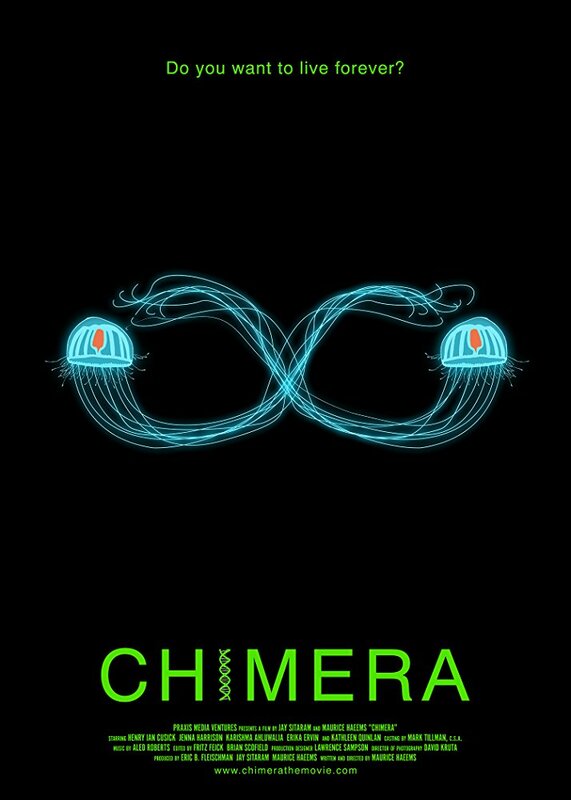 and other such terms I know very little about, not so much about the chimera from Greek mythology but that too can be considered symbolic in this movie. Billed as a Sci fi/thriller this does have plenty of horror elements to it. The overall feel is a panic driven frenzy and very eerie with some graphic depictions of surgical procedures on both humans and animals. The soundtrack is very effective, the effects very well done and it boasts a great cast featuring Henry Ian Cusick (Lost), Kathleen Quinlan (Apollo 13) and Erika Ervin aka Amazon Eve (AHS) to name a few. It does flit between reality and illusion which can be a bit confusing and some of the sciencey stuff is a tad baffling but it does all make sense in the end. For a first time effort Haeems has well and truly nailed it with just about everything to create a captivating and suspenseful movie. I thoroughly enjoyed this and found it a great start to my years viewing.